If you owe Uncle Sam $100 million or more, one check isn't going to cut it. Starting next year, the IRS will no longer accept checks of more than $99,999,999.00. Those taxpayers (or businesses) that owe in excess of that amount will have to break the payment up into two or more checks or transfer the money electronically via Fed Wire to cover the debt. Any checks exceeding the limit will be returned. The government does not have processing equipment that can handle checks of more than $1 million. So any checks that include seven figures or more must be manually processed. But since that increases the risk of errors, fraud and uncollectable funds, Treasury has decided to minimize the risk by limiting checks to eight figures or less. "In addition, the large check items may become lost or mis-shipped, stolen, and require special handling procedures by the TGA [Treasury General Account] banks," wrote David Melter, director Over the Counter Division at the Department of Treasury, in a letter. But there might be more supersized tax bills than you think. The Treasury Department reported an increase in large-sum checks recently. 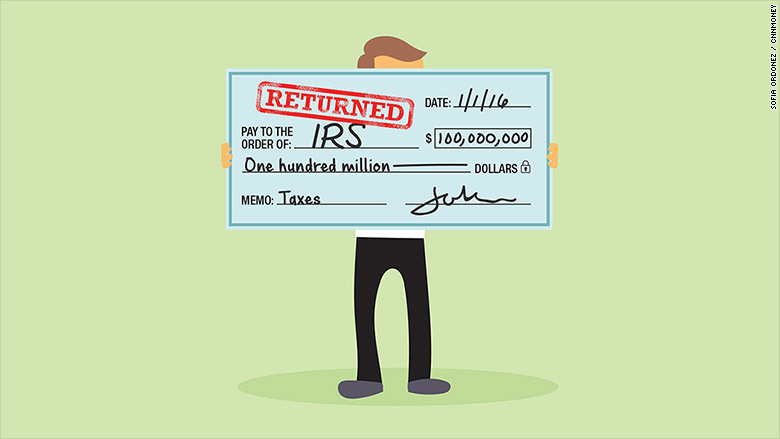 Over the last tax season, the IRS deposited 14 checks that exceeded $99,999,999.